An insanely sadistic husband tortures andkills his faithless wife and her lover only to have them return from the grave. Muriel and David are caught in an adulterous affair by her sadistic husband Stephen, who subjects the couple to horrific tortures in his laboratory. He viciously executes them, but they are far from being disposed of. The unholy lovers return from the grave to wreak horrifying revenge on the scheming doctor and Muriel's psychotic twin sister, Jenny. Originally released as Amanti d'Oltretomba, this incessantly gruesome film draws high praise from fright-fest connoisseurs. 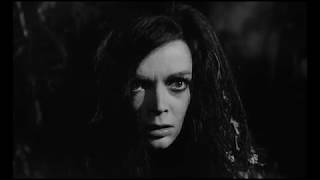 Barbara Steele has a dual role in this Italian production concerning a mad scientist who tortures his unfaithful wife and her lover to death only to have them return from the grave for revenge. With a score by Ennio Morricone. I like this title better and if you like Barbara Steele, this is another one for your collection! Screen this with 'The Ghost'!! !